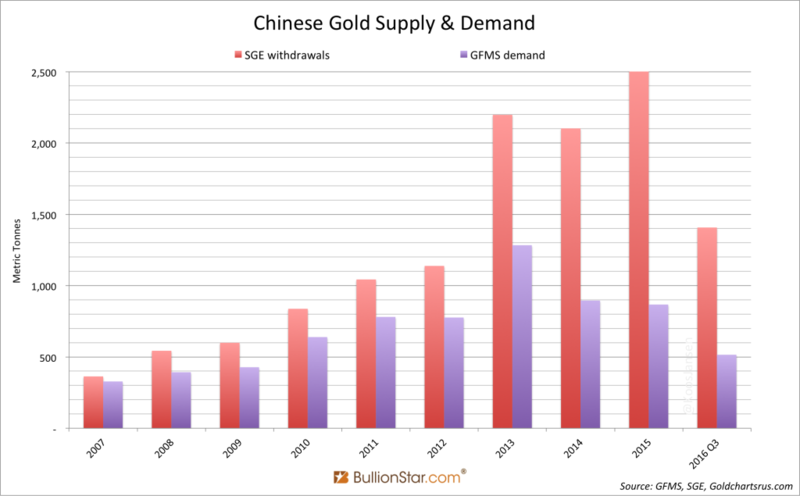 The vast majority of overall gold demand in China is met by gold withdrawals from the Shanghai Gold Exchange (SGE). This ‘Wholesale’ gold demand consists of 2 main components, namely consumer gold demand and institutional gold demand. Institutional gold demand is a term used to reflect direct purchases of physical gold on the SGE by both institutions and individuals with SGE trading accounts. Western precious metals consultancies are infamous for only reporting consumer gold demand (gold jewellery fabrication, gold bar and coin demand, and industrial gold demand), and by and large ignoring direct purchases of gold on the SGE. Western precious metals consultancies therefore vastly understate the true magnitude of gold demand in China, which, based on SGE gold withdrawals, is far larger than the consumer demand figures would suggest. In China, nearly all physical gold supply flows through the Shanghai Gold Exchange (SGE). Likewise, nearly all gold demand in China is met by physical gold withdrawals from the Shanghai Gold Exchange’s nationwide network of precious metals storage vaults. Therefore, using the broadest definition of gold demand, SGE gold withdrawals are a suitable proxy for overall gold demand in China. This gold demand can be labelled as “Chinese Wholesale Gold Demand” and comprises two main categories, namely, consumer gold demand and institutional gold demand. Consumer gold demand generally refers to gold jewellery fabrication demand, retail physical gold bar and coin demand, and in some cases also includes industrial fabrication demand. Institutional demand can be viewed as individual and institutional investor purchases of gold bullion directly on the SGE trading bourse, and withdrawal of this gold from the SGE vaults. SGE gold withdrawals for 2016 totalled 1970 tonnes. Although this was 24% lower than 2015’s record 2596 tonnes of SGE gold withdrawals, it was still in line with 2014’s total of 2102 tonnes of gold withdrawals. 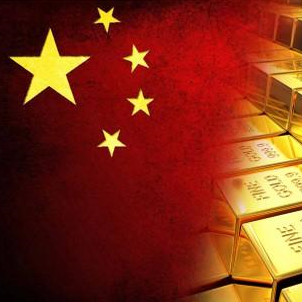 Controversially, a number of Western precious metals consultancies, such as the World Gold Council, limit their definitions of Chinese gold demand solely to consumer gold demand. For example, for 2016, the World Gold Council (which uses gold demand data collected by consultancy Metals Focus) reported Chinese gold demand of 913.6 tonnes, comprising jewellery demand of 629 tonnes, and gold bar and coin demand of 284.6 tonnes. This total is less than half of total SGE gold withdrawals for 2016. What these consultancies methodologies fail to take into account, however, is that direct purchases of gold by institutions and individuals with trading accounts on the Shanghai Gold Exchange represent a substantial additional component of overall Chinese gold demand above and beyond consumer gold demand. BullionStar Gold University article “Mechanics of the Chinese Domestic Gold Market” illustrates that a series of simple equations generally hold true for gold supply and demand in the Chinese gold market, and that any comprehensive definition of true Chinese gold demand must take into account both consumer gold demand and direct purchases of gold at the SGE. Here, disinvestment refers to the sale of gold which was previously purchased directly for investment. Recycled distortion is a term that refers to recycled gold that is not scrap and that is not disinvestment. An example would be process scrap. Recycled distortion flowing through the SGE vaults overstates both the supply and demand sides of the equation, and needs to be subtracted from SGE withdrawals since it could be scrap that re-entered the supply chain. When Recycled distortion is subtracted from SGE withdrawals, the result can be viewed as ‘True Chinese gold demand’. As a reminder, standard gold ingots and bars are VAT exempt when sold on the SGE but not when sold outside the SGE (off SGE). In contrast, non-standard gold is VAT exempt when sold outside the SGE, and non-standard gold cannot be traded on the SGE. Standard gold refers to gold ingots of 1 kg, 3 kg (both 999.9 fine), and 12.5 kg (995 fine) weights, and also gold bars of 0.1 kg and 0.05 kg (both of which 999.9 fine). An example of non-standard gold would be a 0.2 kg (200 gram) gold bar. Given that ‘True Chinese Gold Demand’ comprises both consumer demand and institutional demand, it’s important to look beyond the consumer demand categories of gold jewellery fabrication, gold bar and gold coin demand and industrial fabrication, and to also examine the ‘institutional demand’ category, i.e. a category which really refers both individual and institutional direct purchases of gold on the SGE. 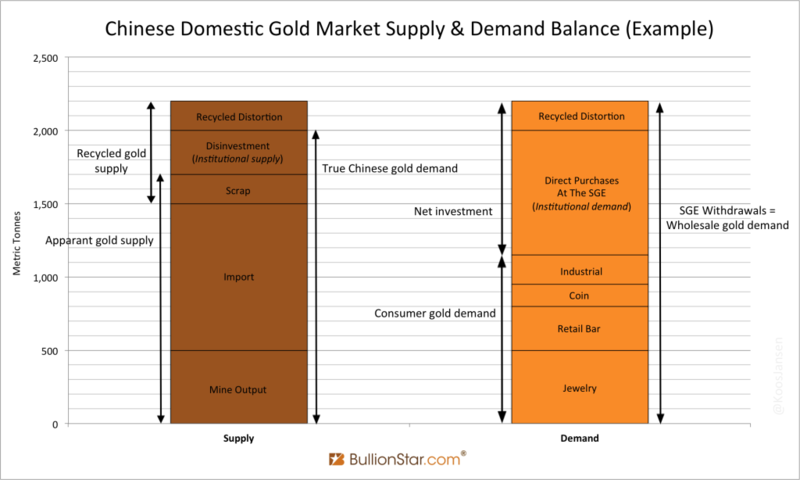 The following bar chart graphically captures both the supply side and demand side components of the domestic Chinese gold market. The gold supply side comprises gold mine output, gold imports, scrap, disinvestment and recycled distortion. The gold demand side comprises jewellery demand, coin and bar demand, and industrial demand (all of which are consumer related), a recycled distortion component which is the same size as on the supply side, and also direct gold buying on the SGE (institutional demand). From the above bar chart, it can be seen that the main reason why annual gold demand, as defined by precious metals consultancies, is far lower than the size of SGE withdrawals each year is because these consultancies only estimates consumer gold demand and ignores institutional demand. By ignoring institutional demand, which is essentially investment demand, the consultancy data is vastly underestimating investment demand for gold in China. The Western consultancy data is therefore incomplete and is not an accurate representation of full gold supply and demand in China. The composition of ‘Direct Purchases on the SGE‘ is also illuminating. In China, anyone can open an account and buy gold directly on the Shanghai Gold Exchange. This includes individual citizens and wholesale enterprises such as jewelry manufacturers and bullion banks. About 50% of SGE gold withdrawals are from wholesale gold manufacturers/fabricators. 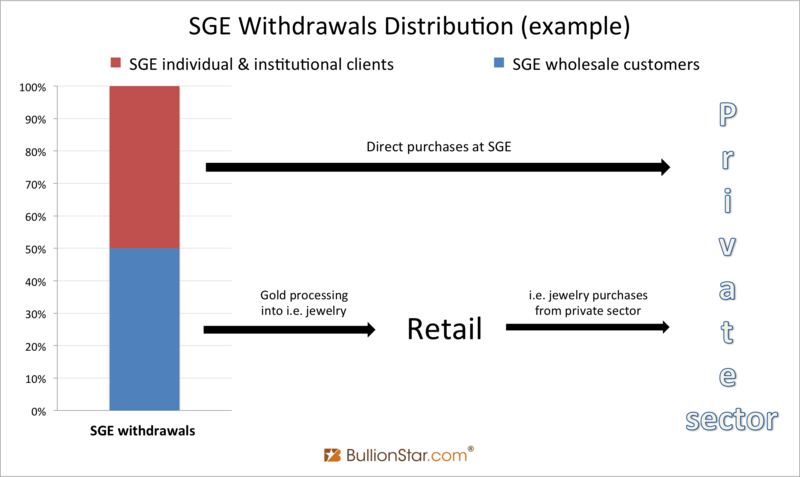 The other 50% of SGE gold withdrawals are from individual and institutional customers who purchase gold on the SGE and then withdraw it from the SGE vault network. Although there is little transparency into why these commercial banks are holding gold on their balance sheets, these banks do, to various extents, report gold holdings in their accounts, although the reporting is not generally granule in nature. It is also not clear how much these commercial bank gold activities influence SGE gold withdrawals. The first component, gold savings or gold deposits, represents customer gold held in Gold Accumulation Plans (GAPs) operated by these the banks. Bank customers have a claim on this gold and so it is a liability of the bank, but the bank also records the same gold as an asset on its balance sheet. Some of the banks offering GAPs in China include ICBC, China Construction Bank, and Bank of China. For example, as of the end of 2014, ICBC held GAPs representing more than 250 tonnes of gold, and GAP customers in excess of 1 million. In the second component, since Chinese banks offer an array of retail gold investment products through their branch networks and also via the internet, these banks need to hold their own gold inventory held to back up these activities. This is also reflected on Chinese bank balance sheets as an asset. Thirdly, Chinese banks, such as Bank of Communications and Shanghai Pudong Development Bank, are involved in the gold leasing market, and they record this gold leasing / and gold interbank lending activity on their balance sheets. As to how much of this gold leasing business represents SGE gold withdrawals is unclear, but much of the interbank leased gold probably stays within the SGE vaulting network.